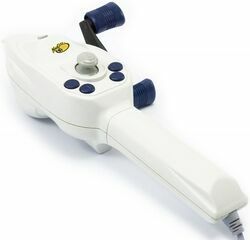 The Rumble Rod is a third-party fishing controller released by Mad Catz as an alternative to the Fishing Controller. Aside from being cheaper, it is not thought that the Rumble Rod offers anything over the official variant other than aesthetic differences. It is also thought to have received a much smaller production run.